Over the past few years, as we've educated people on Agenda 21 and its UN origins, the natural reaction by concerned citizens and property rights activists has been to rush into city hall and accuse their elected representatives of enforcing international policies on the town. This has, of course, been met with skepticism and ridicule on the part of some of the officials (and encouraged by the NGO stakeholders and planning organizations that stand in the shadows). Today, the promoters of Agenda 21, including ICLEI and the American Planning Association (APA), have worked overtime to paint our movement as crazed conspiracy theorists wearing tin foil hats and hearing voices. If we are to gain ground and ultimately defeat the Agenda 21 monster that is systematically ripping apart our Republic, then it's time for our movement to learn from our mistakes and become more sophisticated in our approach. In short, it's time to fight smarter. Here's an undeniable fact: Agenda 21/ Sustainable Development cannot be enforced without damaging private property rights. So, we need to begin to challenge the planners' new "visions" for our communities by focusing on the direct affect those plans will have on our private property. However, to effectively take that step, we must first have a clear definition of what we mean by property rights. Otherwise various ideas of the meaning will confuse the issue and damage the effectiveness of our fight. In the American Policy Center's brand new "Stop Agenda 21 Action Kit," I have included a full page of definitions and quotes from our Founding Fathers, based on the ideas of John Locke. He is the man who greatly influenced Thomas Jefferson and others who established this nation. So these definitions fit well with the Founders' intent as the nation's laws on property were written. As a quick guideline, here is an appropriate definition as written in a "Fifth Amendment" treatise by Washington State Supreme Court Justice Richard B. Sanders (12-10-97): "Property in a thing consists not merely in its ownership and possession, but in the unrestricted right to use, enjoyment, and disposal. Anything which destroys any of the elements of property, to that extent, destroys the property itself. The substantial value of property rights lies in its use. If the right of use be denied, the value of the property is annihilated and ownership is rendered a barren right." Once that definition has been established it can be used as a guideline for drafting legislation and resolutions in state legislatures and city halls. It can also be used by local activists in their fight against Agenda 21/Sustainable Development policies. Let me give just one example that is in the Action Kit, which I have been teaching to activists across the nation. In the Stop Agenda 21 Action Kit I have placed a document called "Resolution for the Protection of Citizen's Property Rights." As I explain how to use it, I offer these important words of caution. (1.) This is not a legal document and it can be changed to suit your community's individual needs. The Resolution is designed as a tool to draw out elected officials on their stand on protection of property rights. 2. Do not try to do what I am about to suggest ALONE. It will only work in a well coordinated action. For those allotted three minutes which most local governments allow for citizen input during their meetings, walk up to the mike and say, "As you are bringing these planners and plans into our community, I just have one question. What guarantees do I have that you will protect my private property rights?" At this point you have not attacked planning and have not mentioned Agenda 21. In addition, you have just asked the one question every property owner in the county wants an answer to. I can practically guarantee that each of your elected officials will swear to that "Of course," they will protect property rights. Hey, they are property owners too, you will be assured. At that point, simply smile and say, "I'm really happy to hear you say that, but ladies and gentlemen, I'd like to have it in writing please. That's when you present the Resolution for the Protection of Citizen's Property Rights. If you can read it to them, so much the better. All this document basically says is, if the government is making plans that will affect your property, then they will bring you into the discussion. Now that is a radical concept! I can also practically guarantee that not a single official will sign that document. And when they announce that they will not sign, you will then ask the most radical question in the English language: "WHY?" And let them talk. They will have many excuses. But the real reason is that they know their plans cannot be implemented if they sign that document to guarantee protection of private property rights. Moreover, unseen by you is the cabal of non-governmental organizations and self- appointed stakeholders standing in the shadows, now alarmed, telling them they can't sign it. Now, this is why you cannot take this action alone. If you have carried it this far on your own, once they say no, you are done. It will all be quickly shoved under the carpet as if it never happened. You must have ten or fifteen more citizens to stand and say "Why?' This needs to be the beginning of your effort – not the end. Next meeting you need protesters with signs asking why they won't sign a document to guarantee your property rights. You must organize in every way possible to get that message out to the citizens of your community – from letters to the editor, to news releases, to knocking on doors with a petition signing campaign. The real purpose of the Resolution is to lay the ground work for a campaign to run these officials out of office. Keep in mind, the only reason those NGOs and Stakeholders have any power is because your elected officials have given it to them. Your only hope to get them out of your community and restore local rule is to elect officials who see government's purpose as you do. The Stop Agenda 21 Action Kit. It is the most complete tool ever created to fight Agenda 21. It contains the most comprehensive information on Agenda 21 ever gathered, including policy details, documents, history of where it came from, and the NGOs who created it. The Kit detail's the planning groups who enforce it and new tactics and tools on how to fight back, including everything I have described in this article. It's all packed into four manuals, two DVD sets and two special report booklets. 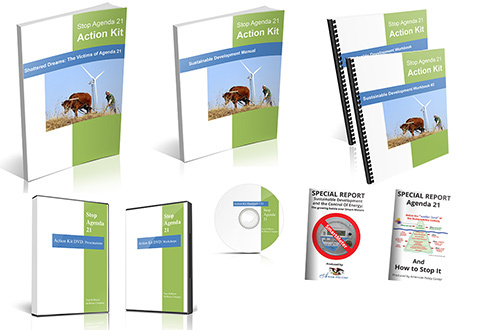 APC's Stop Agenda 21 Action Kit is available at www.americanpolicy.org/kit. It's time to take serious action to stop this monster. Some have asked me if, by publishing these details I'm not giving away our tactics. My answer is this: I have no hidden agenda. I have nothing to hide. I only want to protect property rights. And so, I would openly discuss the procedures described here, telling officials every detail. And then I would ask them this question... "As you bring these plans and planners into my community, what guarantees do the citizens have that you will protect their property rights?" They have no answer. Try it.